Post-World War II American publishing was transformed by the introduction of the paperback. By 1946 there were over 350 softcover titles in print (three times as many as in 1945), with Pocket Books, Avon, Popular Library, Dell and Bantam all publishing in the paperback format and replacing the pulp magazines on the newsstands. Several of the best postwar crime novelists – David Goodis, Jim Thompson, John D. MacDonald, Gil Brewer – were about to begin writing paperback originals. 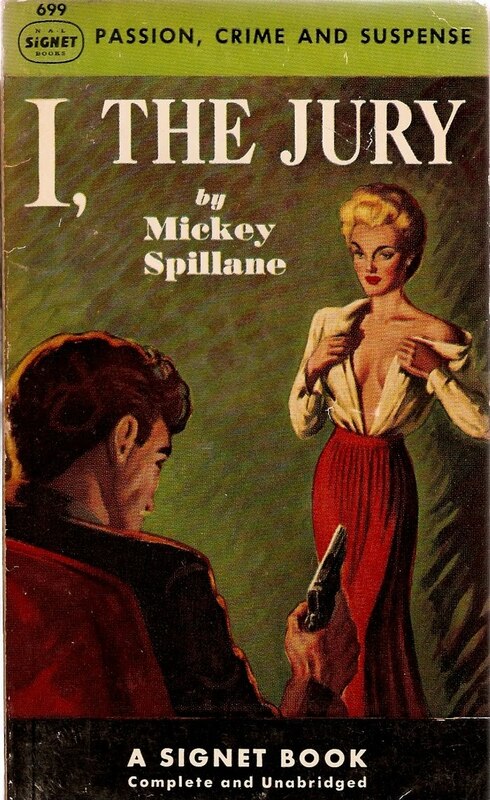 The great boom in paperback publishing, however, was initiated by the novels of Mickey Spillane. Needing a thousand dollars for the materials to build his own house, Spillane wrote I, the Jury in 1947. The novel only sold about seven thousand copies in hardcover but, as a Signet paperback, sold over two million copies in two years, an achievement that ‘electrified and inspired the softcover book industry’ (Lee Server, Over My Dead Body). Gold Medal saw the possibility of publishing paperback originals, and they were soon providing an entirely new kind of market for crime writers, whose work could now for the first time go directly into cheap softcover editions. 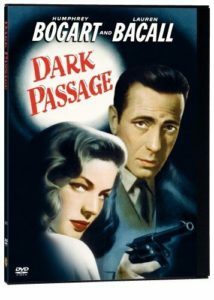 As the phenomenon grew, the struggling, often isolated crime writers fed both the ‘gloriously subversive era’ of American paperback publishing and a burgeoning output from Hollywood of films that would in due course be grouped together under the name French critics had given them – ‘these “dark” films, these films noirs [which] no longer have anything in common with the ordinary run of detective movies’ (Nino Frank). The American economy continued to expand during this period and the country established both its military and economic power, with real incomes soon doubling. Unprecedented affluence made it seem that the Depression had been an historical aberration. Increased affluence, however, was accompanied by materialism and conformity to an ideal embodied in the family home, the site of integration into the cultural order. This was a period in which many felt that the individual was powerless against the large-scale forces of industrial and technological mass society, and during which the pressures towards conformity were heightened by a national mood of self-righteous aggressiveness, directed not just against Communism abroad but against those at home who were regarded as seditious or subversive of ‘the American way’. Cold war apprehensions and suspicions and McCarthyite witch-hunts helped create the atmosphere of fear and paranoia that is so strongly present in both the cinematic and the literary noir of the fifties. 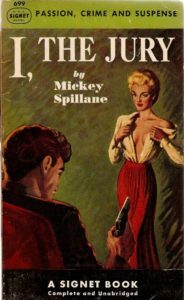 Mickey Spillane’s early Mike Hammer novels were immensely popular in the late forties and early fifties (they were published 1947-52). His sales were phenomenal – over fifteen million copies of his books sold by 1953. One of the acknowledged masters of hard-boiled fiction, Spillane exploits the possibilities of the style in ways that make his novels very different from those of Chandler and his heirs. Spillane is described by Ed Gorman as ‘the great American primitive whose real talents got lost in all the clamour over the violence of his hero. He brought energy and a street-fighter’s rage to a form grown moribund with cuteness and imitation Chandler prose.’ Like the earlier pulp tough guys, Hammer is primarily used to expose and punish the kinds of vice associated with the evil metropolis – narcotics, the prostitution racket, blackmail. He assails the corruption that is engendered by wealth and power and that lurks under apparently admirable surfaces. Confronted with duplicitous enemies, Hammer shares the noir protagonist’s alienation, his world-weary despair and his anger at urban corruption. But in contrast to many earlier hard-boiled writers, Spillane is led by his sense of life’s viciousness towards right- rather than left-wing views. Mike Hammer acts out McCarthyite paranoia. It is not capitalism itself but hidden, conspiratorial organisations subverting American life that are to be feared, among them the communist party. Other thriller writers of the time expressed anxieties generated by McCarthyism; Spillane, on the other hand, expresses the fears that motivated the McCarthyite witch-hunts. Hammer’s savage one-man crusade is in some ways that of the existential loner, but he also has the views of the disgruntled moral majoritarian, directing his violence against a variety of demonised others suspected of subverting American life. Gold Medal lured original manuscripts out of some ‘big name’ writers like W. R. Burnett and Cornell Woolrich; but the company was also remarkably successful in finding new or unestablished novelists. John D. MacDonald, Charles Williams and Gil Brewer, none of whom had previously published novels, all began to write for Gold Medal in 1950-51. Brewer wrote some 30 novels between 1951 and the late 60s – very often involving an ordinary man who becomes involved with, and is often corrupted and destroyed by, an evil or designing woman. His style is simple and direct, with sharp dialogue, often achieving considerable intensity. David Goodis, after the success of Dark Passage as a Hollywood film (1947), had a brief career as a Hollywood script writer, and when this collapsed at the end of the forties he retreated to his home town of Philadelphia and started writing his bleak paperback originals, the first of which, Cassidy’s Girl, was a best-seller for Gold Medal in 1951. Leigh Brackett’s reputation as a crime writer is based on an output of only five novels, though she wrote well and prolifically in a variety of other genres. One of the very few women writers to contribute to the hard-boiled fiction of the fifties, Brackett acknowledged Chandler and Hammett as major influences, and worked effectively to achieve fast-moving dialogue, well-paced suspense and good timing. 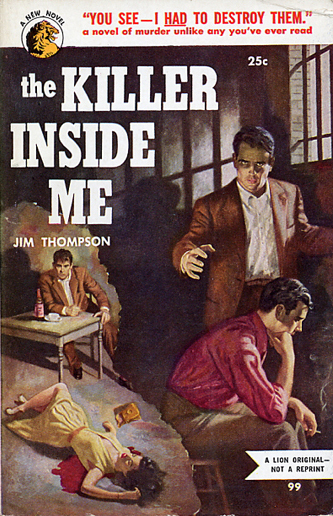 From 1949 on, with Nothing More Than Murder, Jim Thompson created a succession of off-beat and subversive portraits of psychologically disturbed protagonist- murderers. Nothing More than Murder was followed by The Killer Inside Me (1952), Savage Night (1953), A Hell of a Woman (1954), The Nothing Man (1954), A Swell-Looking Babe (1954) and Pop. 1280 (1964). All but A Swell-Looking Babe are written in the first person, and all use the form for savage satiric exposure. Perhaps the most remarkable and ambitious of these are the first novel Thompson wrote for Lion, The Killer Inside Me, and companion piece written a dozen years later, also for Lion, Pop. 1280. In both novels, the alienated position of the psychopath creates a perspective from which he looks down on his small-town society as a scathing observer, stripping off illusory surfaces and denouncing what he sees. Robert Elliott, in The Power of Satire, quotes Ben Jonson’s lines on Archilochus, who according to tradition could ‘Rime ‘hem to death’. This ‘curious legend’, as Elliott observes, captures something of the ‘malefic power’ of the satirist to wound his enemies: ‘The word could kill; and in popular belief it did kill.’ For Lou Ford and Nick Corey, the killer-protagonists of The Killer Inside Me and Pop. 1280, there is also a strong connection between the ‘malefic power’ of words and the act of murder. The satirist’s curse is a substitute for killing: ‘I wanted…[to] do something worse’ (Killer Inside Me). When Lou and Nick do kill, they represent themselves as simply taking to a logical conclusion their critiques of small-town American society, and as putting into practice the secret wishes harboured by others. Both are ‘typical’ not just in the sense that they have the chameleon-like ability to impersonate ‘normality’ but also in that they do ‘what other people merely think’. Thompson was a writer so disturbing and original that one wonders, with Geoffrey O’Brien (Hard-Boiled America), what contemporary readers made of the Lion paperback originals they picked up at newsstands, with their cover promises of ‘a cheap and painless thrill’. One of the most remarkable of the fifties successors to writers like James M. Cain and Horace McCoy, Thompson was more self-consciously modernist than either and, in his best-known novels, far more radically unsettling. The French proclaimed him to be ‘le plus noir’, the most American and the most pessimistic of the noir thriller writers. See also: http://www.litencyc.com/LitEncycFrame.htm, for Lee Horsley, article in the online Literary Encyclopedia on ‘The Noir Thriller’.